Employee engagement is a term that all managers will hear (and use) at some point in their careers. After all, what manager wouldn’t want their employees to be engaged in their work? But beyond that superficial appeal, employee engagement can be the key to your company’s success. What is employee engagement, really? Why is it so important? And above all, how can managers spark deep engagement in their own teams? A quick definition of employee engagement is the level of emotional commitment the employee has to their workplace and its goals. 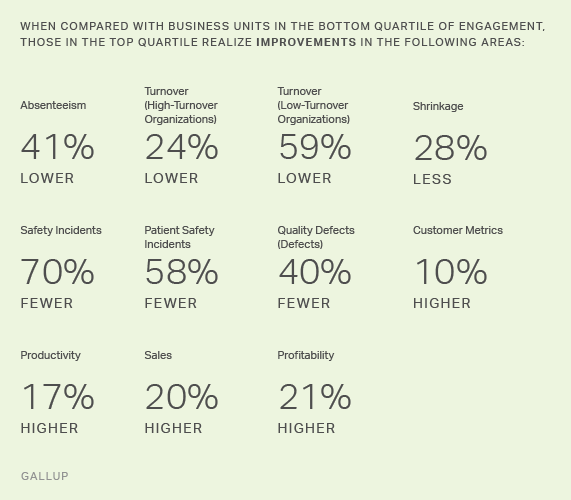 The key word here is “level.” Engagement is not a binary concept, so to think of employees simply as “engaged” or “not engaged” misses a large amount of nuance. Disengaged—The people who are solely there for the paycheck, watch the clock, and are so unhappy they would even consider quitting without another job lined up. Winning back a disengaged employee is a Herculean task. Not Engaged—These employees could enjoy their job more, but either dislike their working conditions, their manager, or both. They may be reading job ads but likely aren’t actively applying to anything but the most appealing options. Almost Engaged—This group is content with their work but aren’t shouting it from the rooftops. They wouldn’t leave unless tempted by something really great, and although they know they’re a part of something bigger, they don’t feel passionate about it. Engaged—These employees feel they’re a vital part of the business and that their work is important. High achievers, they may feel overly busy and stressed, but still happy in their role. Highly engaged—You've probably seen these employees proudly sporting their company’s logo on their hat, their backpack, and their car. They LOVE their jobs and workplaces, are big-picture thinkers, and care deeply about helping their coworkers feel just as happy and fulfilled. As you can imagine, a workplace full of employees who fall in low-engagement categories would struggle mightily with productivity and retention. However, that’s the reality for many American businesses. Gallup’s 2017 State of the American Workplace report reveals that 51 percent of employees are not engaged—and haven’t been for some time. How does this translate into the everyday workplace? An employee with low engagement may call in sick more often, waste more time, produce poor quality work, and take up an undue share of their manager’s time and attention. Perhaps most damaging, however, is that low engagement is contagious. An almost-engaged or not engaged employee can quickly become disenchanted with their work when exposed to the toxic onslaught of negativity from the actively disengaged employee. This workplace “emotional contagion” is a common phenomenon, but one that may slip under the radar of managers due to its gradual, insidious nature. On the other hand, organizations with highly engaged employees realize some amazing benefits. Those numbers can be transformative to any organization, big or small. The question is how to get there. There is plenty of advice out there about increasing employee engagement, much of it focused on superficial tactics like ping-pong tables or antiquated “team-building” exercises. To truly grow employee engagement, however, managers need to dig deep into what motivates their people. Extrinsic motivators are sticks and carrots—your basic punishments and rewards. Things like raises, firings, promotions or demotions, or “progressive discipline” plans are all examples of extrinsic motivators. Intrinsic motivators, on the other hand, are motivators that come from within, like the satisfaction of doing good work or the joy of making a difference. Many companies rely solely on extrinsic motivators. And while they are important (even the most engaged employee would start to feel devalued if years go by without a raise), they’re not the motivators that create deep and lasting engagement. Instead, think of extrinsic motivators as tools to support engagement, not create it. You may be wondering, “How does this apply to wellness programs?” It applies in two ways, actually. First, a successful wellness program will use both extrinsic and intrinsic motivators. For example, it may offer reward points to employees who stop smoking. The points are an extrinsic motivator—a gratifying element that makes the effort more pleasant. However, what if the program also offers coaching and exercises that help the employee verbalize that they want to be healthy for their newborn? That’s an intrinsic motivator, and it’s more likely to drive the employee to success. Second is the fact that a wellness program itself can become a workplace motivator, not just a wellness motivator. When a company offers a robust and exciting wellness program with great rewards, the organization becomes more appealing for employees, which creates an extrinsic motivator for employees to stick around. However, if this wellness program digs deep into employees’ intrinsic motivators toward wellness, this can create a multiplying effect where the employees’ newfound sense of purpose leads them to strive in all areas of their life—including their work. So, we now know that it’s vital to grow the engagement of employees, and that intrinsic motivators are what lead to true drive. Close management is understandable if the role requires adherence to certain procedures. But whenever possible, allow employees to problem-solve and develop their own approach to get the job done correctly. For example, if an employee tells you about a problem, don’t leap in to solve it for them. Instead, ask them how they think it should be solved, and if their suggestion makes sense, give them the authority to run with it. By empowering employees and demonstrating that you trust their judgment, you set the stage for engagement. This same principle can apply to wellness programs. Not everybody needs to run a 5K. Some people’s path to physical wellness may involve swimming, or yoga, or Kickboxing for Dummies. Letting people chart their own path to results makes them more likely to enjoy (and stick with) what they’re doing. People naturally want to be good at things. And yet, when they improve their skills, they may outgrow their role. This can cause frustration for managers who would prefer their staffers to stay in their tidy little boxes. However, holding people back is a recipe for dissatisfaction and disengagement. Instead, encourage your people to develop and master new skills, and then help them adapt their responsibilities to take advantage of these new skills. The goal is work that is neither too easy (boring) nor too difficult (frustrating). This is a big one, and it’s the principle that underpins everything we do at WellRight, not only in our programming but in how we operate our business. In Pink’s book, he says that purpose leverages the human desire to be part of something bigger. This makes sense. We all want our work to mean something, even if it’s something small, like helping brighten a commuter’s day by giving them the correct change at a toll station and wishing them a good morning. People have a personal purpose—a topic or cause that gets them excited and revs up their passions. For some, it’s finding ways to make tasks easier. For others, it’s helping the disadvantaged. And for others, it’s about creating something lasting. Then, of course, there’s the company purpose. If the company purpose aligns with or complements the employee’s personal purpose, that fosters massive levels of engagement. Think about nature-lovers who work for The Nature Conservancy. Or an innovator who works for Apple. But what if your company purpose doesn't naturally attract a homogeneous "type"? That’s okay. This is a great opportunity to find out the personal purpose of your individual team members and then use your corporate wellness program to help them scratch that itch. For example, your animal-loving employees might adore an emotional wellness challenge that has them volunteering at an animal shelter. Speaking of your wellness program, purpose is one of the most powerful intrinsic motivators and therefore is the key to lasting change. Dig deep. WHY do people want to become healthier and improve their wellness? How do they picture their lives with improved wellness? Coaching can be an excellent way to help employees discover and harness their purpose toward wellness. Developing stronger employee engagement isn’t an overnight process. To develop real and lasting employee engagement, employers must commit themselves to understanding how engagement works, why it’s so important, and what truly motivates their team members. Want to know more? Our Ebook, 8 Ways to Foster Employee Growth and Engagement With Your Wellness Program, gives you solid, actionable advice on how to create a workplace environment that is conducive to employee growth and engagement.